Detection and recording of Schumann resonances and other electromagnetic phenomena at frequencies below 50 Hz. The emphasis here is on the detection of natural electromagnetic radiation , with my particular interest being the Schumann Resonances from 8 ....... 45 Hz. Schumann resonances are generated by the numerous lightning discharges around the world, injecting shock energy into the spherical space ("cavity") enclosed between the earth's surface and the ionosphere. This mechanism is much the same as generating microwaves within a metal cavity,like a waveguide, by means of small electric spark discharges (spark transmitter).The earth-ionosphere cavity is physically extremely large, therefore its resonant frequency is not in the microwave region, but virtually below the audio frequencies.The fundamental frequency is ~ 7.8Hz , with several harmonics and other "wave-guide modes" making up the range of 7.8, 14, 20, 26, 33, 39 and 45 Hz.The height of the ionosphere varies according to the (local) time of day, etc., and this alters the exact frequencies. The Schumann resonances are fairly broad, unlike man-made signals, which are normally nice and sharp. The reception of Schumann resonances proved to be surprisingly difficult, and in the course of the efforts to build equipment capable of reliable performance a number of systems were constructed and operated . These are out lined as follows, together with technical details and observational results. One is simply a loop in the ground. A 40-core telephone cable was buried in a 400mm deep trench, shaped as a 25 x 53 metre rectangle. All the cores are connected in series (with a centre connection after 20 turns), resulting in a rectangular coil of 20 + 20 turns, with an effective window area of 53,000 squ.metres. The overall loop inductance is 427mH, total resistance 546 Ohms. Although it is capable of picking up signals up to 25kHz into the VLF region, its principal use is for frequencies below 50Hz. Next I constructed a 200 turn, 4m dia. "Octoloop" (left image). Its effective window area is 2650 squ. metres . The winding was made with a length of 100 pair telephone cable, several groups of cores can be selected to function as a 30 turn up to a 200 turn coil. 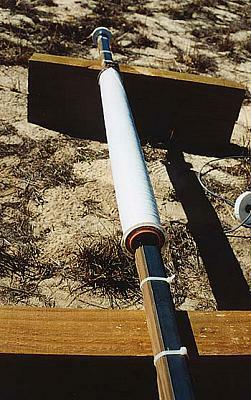 The Octoloop was operated at various times as high as VLF, and as low as 2 Hz. Its principal use was the range 1 - 8 kHz, but more recently it was actually my first antenna with which I was able to detect and record the Schumann resonances. The major drawback of the Octoloop is its sensitivity to slight movement by wind., causing "microphonics" . Finally I had to construct the type of device with which the "professionals" use to study the Schumann resonances, namely a large induction coil. I wound my coil of 69,300 turns on a 800mm length of 50mm dia. 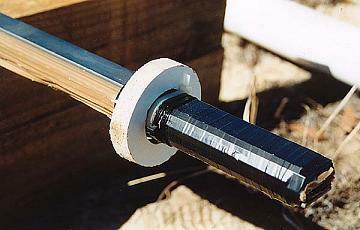 PVC pipe, using along threaded rod through the coil former (pipe). This was at one end clamped into the chuck of an electric drill, which in turn was held in place in a bench vise. The opposite end of the threaded rod was located through a hole in an improvised bearing bracket bolted to the workbench. Finally the rod's end connected to a mech. turns counter. The electric drill was powered by a VARIAC transformer, the best voltage for my particular drill turned out to be around 60...70 Vac. I started and stopped this set-up with a foot switch. It took several hours of continuous high speed winding to get about 8Kg of 0.3 mm dia. enamelled copper onto the former. The finished coil's resistance is 3.64 kOhms , its inductance 10.52 H .
10 lengths of 3mm thick flat steel bar of various widths ( 16...40mm) , each 2 metres long, were then put through the pipe centre to increase the coil's magnetic permeability. Click on the picture to view full screen circuit. This steel mass just about fills the available clear inside coil aperture completely. I could not measure its final inductance, but I guess it must be several kH (!!). The steel bars are insulated from each other, similar to transformer steel laminations.The finished assembly was then enclosed in 90mm dia. 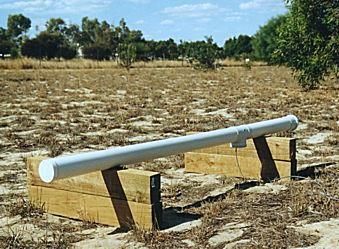 PVC pipe and endcaps forweather protection. Each antenna has its own pre-amplifier and signal conditioner , powered by two 12V / 18Ah sealed lead acid batteries, which are recharged weekly. All signal out-put cables go ~ 70m underground back to the house. 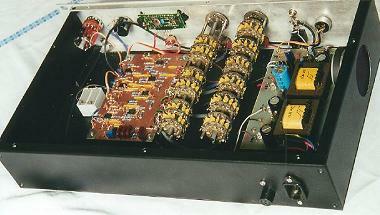 In the picture beside: Standard low noise 0-50 Hz field preamplifier. The signals can be directly switched to the output buffers (13dB) or filtered via low pass and / or high pass filters. Each filter consists of a six pole Butterworth type, switchable in 10 steps, a feature which can be helpful at times.The final output normally drives the line-in socket of the PC's S/B card for signals >5Hz. Signal analysis is done with the aid of SPECTROGRAM, a very useful spectrum analysis program (freeware). Around the clock monitoring can be implemented by running a screen capture graphics program in the back-ground (as decribed by IK1QFK) called 20/20, which is also freeware. Each spectrum screen display is automatically saved at selectable time intervals in the form of .jpg files for later viewing. I also use a standard A/D converter from PICOTechnology , the ADC-11, which is a 11 ch. 10 bit converter. This ADC is packaged within a DB-25 plug shell and connects directly into one of the LPT- ports of a PC. The software is called PICOSCOPE , which also contains an audio spectrum analyzer screen with selectable FFT formats, etc. I mostly use this for observations below 20Hz. 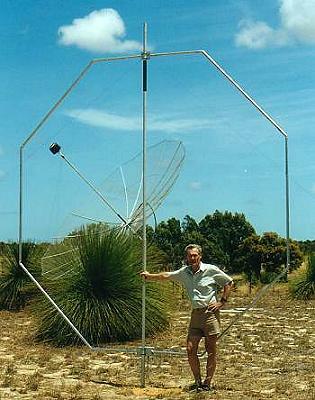 Detection and recording of Schumann resonances proved to be more difficult than first expected. Initially I wanted to use the large ground loop, but never managed to see even the slightest trace of the Schumanns. Renato (IK1QFK) showed me that it was almost impossible to receive them with horizontal loops. Vertical polarization was required; this needed a bit of a re-think..... That's why I built the 200 turn Octoloop, which made Schumann resonance detection possible. But due to loop microphonics, reasonable interference free reception is only possible when there is not much wind. Finally the big induction coil was built; this enables reception unaffected by weather, but (there seems to be always a "but") daytime operation is still riddled with some forms of interference. I call this collectively " human activity" . Because during the early evening hours the various low frequency spectrum spikes (~2......25Hz) slowly disappear and during most of the night clean spectra are recorded. Beside is a comparison trace between the induction coil and the 200 turn Octoloop. See the low frequency spike below 25 Hz. Also tried recording with SPECTRAN, showing first 5 resonances. Throughout the experimentations with Schumann resonance reception it was always obvious that the weather had a profound influence on the quality and appearance of the recordings, at least in my location here. This may well be tied in with the presence of H.V. 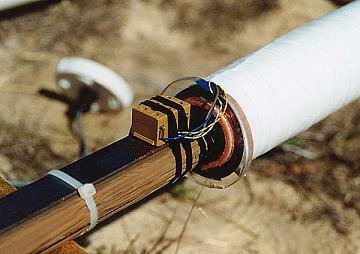 power lines within a km of the sensing coil(s). So far I never had the opportunity to escape into the remote Australian interior with my induction coil and PC, and make a few days worth of recordings , but I'm tempted !! That site should also be of considerable interest to seismic and very low frequency acoustic phenomena researchers........... After studying the material at his site and a meeting with him, I decided to make a similar coil. The added interest was that we could both compare our results over a reasonable distance (~100km).This is a good distance, not next to our own backyards, and also not on a different continent ! Next the coil former was constructed. This was simply a 800mm length of 50mm dia. electrical conduit. The high impact PVC type (orange colour). The end flanges are 50mm I.D. an ~ 85mm O.D. , made from 6mm thick acrylic sheet. This coil former then had to be mounted in a way so that it could be readily driven by a speed controlled power drill when winding the wire on the former. I used altogether ~ 9.5 kg of 0.3 mm dia. enamelled copper wire. The winding was controlled by supplying power to the drill from a VARIAC, set to ~ 65Vac, switched on/off by a foot switch. After a bit of experience it was possible to wind the wire with amazing speed, in the order of several hundred r.p.m. No attempt was made to layer-wind the coil, considering there is no need to worry about high layer-to-layer voltages (only up to a few hundred uV), and conserving coil winding-window space was not an issue in this case. The whole winding was tapped at 31,500 turns; subsequently no use was found for this tapping point (so far).. No more wire was left after ~ 69,300 turns, so the coil was finished then.The total coil resistance was measured as 3.64 kOhm, the inductance 10.52H. Picture of complete coil assembly The coil was then tried out and found to be quite "deaf" , something I was almost expecting.........A bit like building a radio with a ferrite rod antenna, but only using the coil without the ferrite. A huge chunk of ferrite material was never an option for this project, but ordinary steel should be ok because of the low frequencies. The best material would have been transformer laminations, but not with the required shape factor for my coil. The next best thing was considered to be 3mm thick steel "flat bar", which had to be insulated from each other simply with packing tape, to act as a bit of a barrier for possible circulating ("eddy") currents. Some may think inserting a steel pipe or even a solid round steel bar would do the trick; but this will act as a shorted turn (secondary winding) and absorb a lot of signal from the coil !! As the coil former inside aperture is round instead of square, several different widths of steel bars are stacked so that an approximation to the circular shape is achieved. The overall length of all the bars is 2 metres. Adding the steel core made an unbelievably large increase in sensitivity. Receiving Schumann resonances was instantly possible. There was also a significant improvement in the ratio of weak signal to mains power noise observable. The upper frequency limit of the whole assembly is surprisingly high, in the order of several hundred Hz , but in this case it was limited to ~ 150Hz. Finally, the coil assembly had to be enclosed within a removable PVC pipe cover, made from 90mm 'stormwater' pipe & fittings. (This would of course not be required for coils operating indoors).